Original Italy 9KW HSD air cooling spindle, 24000rmp/m. Sweden gear reducers increase output torque while decrease output speed. Imported Hiwin linear guide rail from Taiwan, high precision and durable. Germany helical Racks and pinion transmission for X/Y axis, ensure the machine run smoothly at high speed. 6. Auto changing tools cut labor cost and increase the efficiency, 6pcs auto tool magazines, more capacity magazines could be customized. 7. Auto central oil lubrication system, easy for maintenance. 8. T-slot vacuum table, available to use clamps or vacuum pump, with good suction performance for both whole sheet and special work piece. 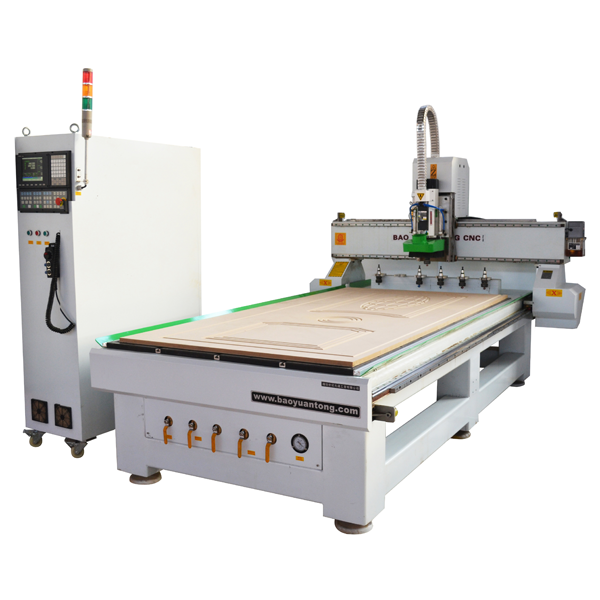 We are professional CNC Router wood manufacturer and provide high quality of China CNC Router wood, and these CNC Router wood are in hot sale around the world.